I will always boldly declare that everything we need in order to design a bicycle-friendly city has already been invented. All the macro-inventory is in place and ready to use. That doesn’t mean we’re done and dusted. We have an ocean of opportunity to tweak, adapt, or improve. Strangely, though, it was wasn’t really happening. 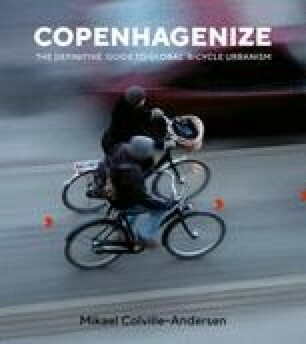 We were content with the status quo in mainstream bicycle cities and ignorant of the need for it in others—until 2006, when Klaus Bondam swung open the door to Copenhagen’s mayoral office and started work. The bag of money he brought with him for cycling was more than a financial boost—it was a catalyst for innovation. It changed the question. City employees were handed an espace libre to think completely out of the box on a scale never before seen in Copenhagen or anywhere else since the 1930s. I was hired by the City on a variety of projects back then, and, man, I can tell you that the energy in the City’s Bicycle Secretariat was electric. The greatest brainstorm in the history of urban cycling was underway. So what were the results? Let’s run through the highlights. Imagine having a city full of things that no other city had.